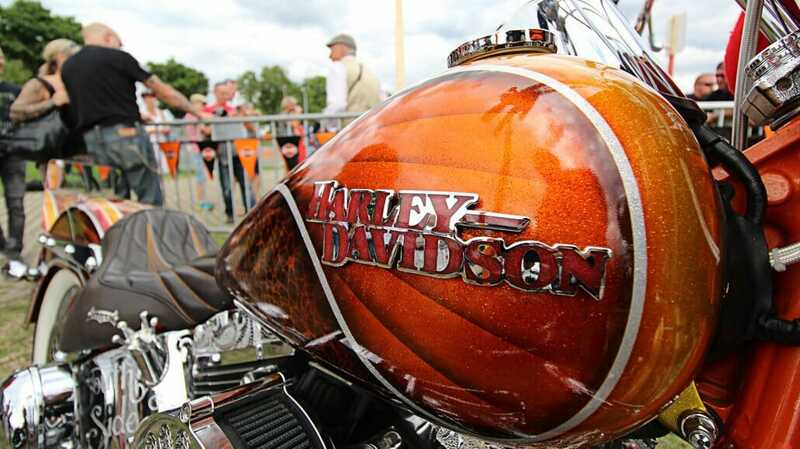 From the 4th to the 6th of August there were the first Dresden Harley Days. Demo Rides, Tatoo Area, Wrestling and Strongman Show, live gigs of six bands and a motorbike parade with over 500 Harleys attracted 25,000 visitors. The festival took place on the “Rinne” near the fair. Around 80,000 square meters of space was used for this purpose. Of course, the complete Harley-Davidson model range was available for marveling and free trial riding. On the show mile bikes went up and down all day. For kids there was a separate area, there was a burnout station and the bullriding had to try to avoid ground contact. About a trophy for the most beautiful bike at Harley Days, someone from Dresden could look forward to. There was also a raffle in favor of the Dresdner Förderkreis for children with cancer. Price was a street 750. One highlight was the motorcycle parade on Sunday with well over 500 Harleys. It was a distance of 26 km through the city which naturally correspondingly looked for attention. The date for the next Dresden Harley Days is already fixed. You will find from 03.-05. August 2018.